Bill of the Birds on Blogspot: Caption Contest #19 Winner! "Birding the Grassland" is brought to you in part by Sure deodorant and antiperspirant - wetness protection for men and women. When you are celebrating that life bird, never let the other birders see you sweat. Our winner is Robert over at Birding is Fun! Congrats Robert! It was really hard for our judges to pick just one winner. So we went with the one that gave us the biggest initial laugh. Kate said...Oh Baird's Sparrow Gods, we beseech you. May you provide us with many close looks and breeding displays! 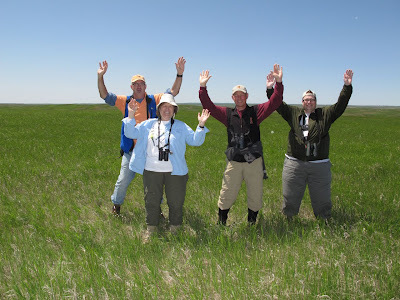 Kelly Hendrix said...Bill and friends trying to lure in a rare bird by doing a fancy mating display to the song "YMCA". Erik (perennial contender) said...The "airing of the pits" made the next 7 hours in the van more bearable. CrystalsCozyKitchen said...How the bird got the gun to hold up the birdwatchers, we may never know. Thanks to all who played! Robert, you can pick up your winner's loot at The Midwest Birding Symposium in one month!